It’s Farmageddon week and there’s no better way to kick off the second week of college football than with some early morning vittles. 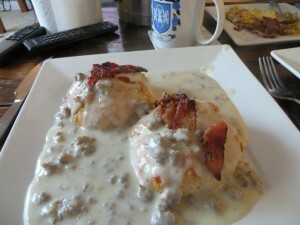 So this week we went with some biscuits and sausage gravy, but with a twist. We will make a meal and STUFF it in the biscuit before we cook it. It’s the only real way celebrate Kansas State and Iowa State’s farm bred rivalry. Let’s do this. In a bowl mix the flour, baking powder and salt. Add the shortening and mix until in little pieces. Add milk a little at a time and mix until it forms a ball. Roll out on floured board to 1/4 inch to 1/2 inch thick. Cut out in desired circular size. Place biscuits on an ungreased baking sheet. Although some parchment paper would help out alot. Crack open one egg and scramble it up in a cup. 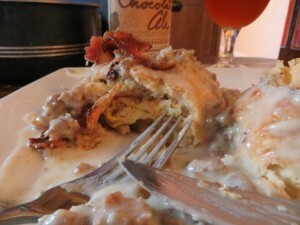 Place the hash browns, eggs, bacon, and cheese in the middle of the biscuit, leaving enough room to fold up. Bake at 450 degrees F (230 degrees C) for 12 to 15 minutes, or until the biscuits are golden brown. Serve with gravy on top and any leftover stuffings. Man o man. It was alot of work as you can see, but it was totally worth it. The biscuits came out perfect. The crunch of the edges and the warm, gooey center matched better than I thought. Each bite had a hearty flavor that changed constantly. I washed it down with some Boulevard Chocolate Ale, mainly because it can serve as a breakfast beer but also because it was light. This is in the lead for Feedings of the Year. Now on to the games. Most of the morning games outside of Farmegeddon sucked. I watched Stanford lose close to USC (shockingly) at the gym. I’m happy to report that I did not watch an SEC conference game. Even the Big 12 games were weak, except maybe the Texas vs BYU game. I would be remiss if I didn’t mention the end of another awesome rivalry. Notre Dame played Michigan for the last time in awhile. It makes sense, the Irish have lost more times than won in the last ten years or so to the Wolverines. So Farmageddon. I knew that last year was a fluke. Fluke as in the blowout was a fluke. This year delivered completely differently. There was no blowout by any team. It ended up being quite competitive. Fortunately for this K-State fan, the Wildcats pulled out late and held on. But it was ugly. First of all, Kansas State went up 13-0 when it should’ve been 21-0. They came out strong but lost their step both physically and mentally. Penalties, missed passes, and poor tackling let Iowa State come back in to the game. Heck they even took the lead by more than two scores. Credit Mark Mangino doing some trickeration on that. The second half was a different story. Jake Waters and company calmed down, stopped making mistakes, and clawed there way back. Well, Jake Waters really clawed this team back. But it was more for running than passing. He didn’t have a passing touchdown but ran for two, with no interceptions. Collin Klein is coaching him up well. So what does this mean for Kansas State? Welp, there’s plenty of film to go over and coach for while getting ready for Auburn. I think if they came out here and whupped Iowa State, they would’ve been punched in the mouth harder against Auburn and may not recover. At least with this game, the flaws are now known and they can fix them before the big Thursday night game. What a great week for college football. The food was steller, the beer washed down great, and I was treated to some heart pounding football. I couldn’t ask for any more. Well, maybe a bigger belly for the biscuits. Or least an extra belly.